Warning! This blog may not be suitable for all readers. Please proceed only if you appreciate chicken livers. Recently back from my ten-week stint in Mexico, I acknowledge that there are other foods in life beyond chilies, tortillas, cheese, and all the fabulous dishes celebrated there. In fact, on my return I had an unexpected craving for chicken livers. It’s not a complete surprise, and because I get a hankering for them about once a month, I tend to stock-pile a container of them in my freezer to head off this sudden biological urge. Yesterday, as I mulled over a nice weekend meal, what glee did I express, when behold! To the rear of my freezer, I spot a lurking carton of chicken livers amongst my depleted pickings. Hallelujah sister! Joy upon joy, I had all the fundamentals for Chicken Livers in Bolognese including three fresh Roma tomatoes and from out in the garden plenty of sage and rosemary. 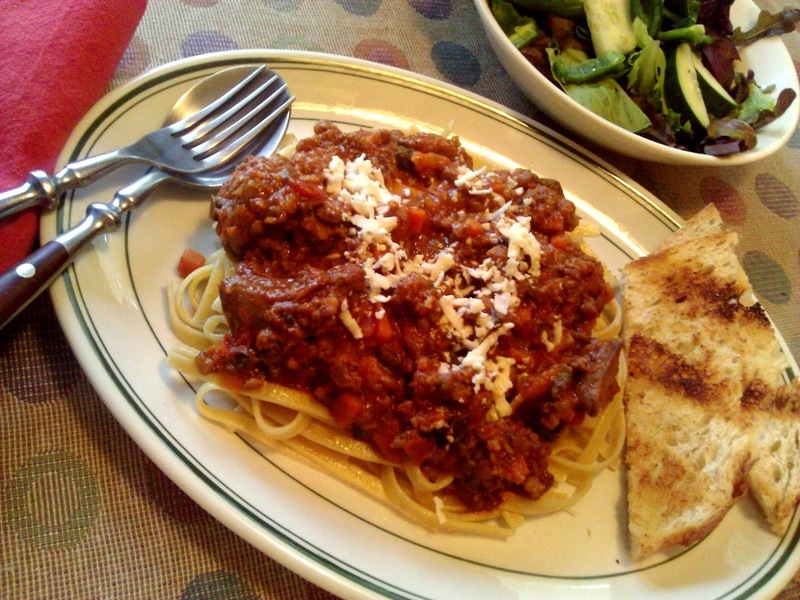 I make my Bolognese the traditional way: a meat sauce simmered with tomatoes and milk. I elected to go with ground pork instead of veal, turkey, or beef because it too, was in my freezer. I can’t say enough about the addition of the milk to the sauce. Fear not: the tomatoes will not curdle the milk; along with a bit of Parmesan cheese, it tends to tenderize the meat and harmonize the sauce. The combination of herbs and spices, plus the addition of the chicken livers, create a marriage made in heaven. Trust me on this one. Now, you are doubly forewarned ― because this comes from an unabashed liver lover. Clean the liver, cut into manageable pieces and pat dry; sprinkle lightly with flour, salt, and pepper. In a large pot heat 2 tbsp. oil and add livers. Brown well on all sides and remove. To the pot, heat remaining oil, add vegetables to soften and remove to separate bowl. Add pork to the pan, break up and brown lightly adding herbs and spices. Deglaze with red wine and loosen bits from pan; add tomatoes, tomato paste, reserved vegetables and the stock. Add the milk, Parmesan, Worcestershire sauce, salt and pepper and stir to combine all. Partially cover pan and simmer about 45 minutes, stirring occasionally until sauce thickens slightly. It will thicken as it sets. Add livers to pan, simmer to finish cooking them and to blend flavors, about 10 minutes; adjust seasoning. If too tart, add a pinch of sugar or a splash of aged balsamic. Best if allowed to set overnight to mellow flavors. Serve over pasta, polenta, or on the side with risotto. Yield: 4 servings. Next: Next post: The Answer is: Millet.